Not everything worth having is easy. Some things take struggle. The refining brings strength, trust in God, and sometimes an unexpected tomorrow. Whether the topic is marriage, our Christian walk, or encouragement to keep believing God's promises, Warren Barfield's latest album stands as a passionate testament to believers not to give up...especially on hope. :Not everything worth having is easy. Some things take struggle. The refining brings strength, trust in God, and sometimes an unexpected tomorrow. 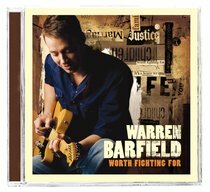 Whether the topic is marriage, our Christian walk, or encouragement to keep believing God's promises, Warren Barfield's latest album stands as a passionate testament to believers not to give up...especially on hope. Singer-songwriter Warren Barfield (born 1979) has released an album every few years since his debut Beyond Me in 2000. Originally from North Carolina, Warren currently lives in Nashville, Tennessee. He has been married to Megan since 2001 and they have a son and a daughter. Warren has had five songs top the Christian charts, received two Dove nominations, and has shared the stage with the best of CCM artists from Steven Curtis Chapman and Third Day to TobyMac. He wrote and recorded 'Love is Not a Fight' which was the theme song for the #1 indie film FIREPROOF. He shares his songs and stories with thousands every year as he tours the US.